The Air and Earth Modules pack for VMR is now available from its developer, Eiosis. MeldaProduction continues its Eternal Madness Discount with 50% off MRhythmizer, MMultiBandConvolution, MMultiBandComb and MMultiBandFlanger plugins. Slate Digital's Everything Bundle now includes the Eiosis Air and Earth modules for Virtual Mix Rack. 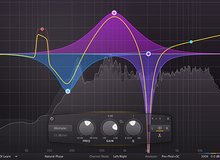 Tokyo Dawn Labs has released TDR SlickEQ-M, a mastering-oriented equalizer plugin derived from its SlickEQ & SlickEQ-GE.